Paris based The International Observatory for Lawyers in Danger (OIAD) (which is an initiative of the French National Bar Council, the Consejo General de la Abogacía Española (Spain) and the Consiglio Nazionale Forenze (Italy)) denounced detention warrant for 80 Turkish lawyers issued by Istanbul Prosecutorial Office. The International Observatory for Lawyers in Danger (OIAD) is alarmed that the repression of lawyers carried out by the Turkish authorities is escalating. During the week of 20 March 2017, the Turkish Public Minister issued arrest warrants for more than 80 lawyers who are defending clients accused of belonging to the Gülen movement, regarded as the instigator of the attempted coup d’état in July 2016. Of the 80 lawyers subject to these arrest warrants, 38 lawyers across Turkey were arrested and placed in detention over the ensuing days. According to the information available to the OIAD, there are now 362 lawyers held in detention in Turkey and 967 who are facing legal proceedings. Among them are the presidents and vice-presidents of around ten bars in Turkey. Since the failed coup d’état on 15 July 2016, the Turkish government has been carrying out an unprecedented purge within the state apparatus itself but also inside the university and legal systems and against journalists. More than 41 000 people have been arrested over the past 6 months and nearly 135 000 people have been suspended or relieved of their functions. 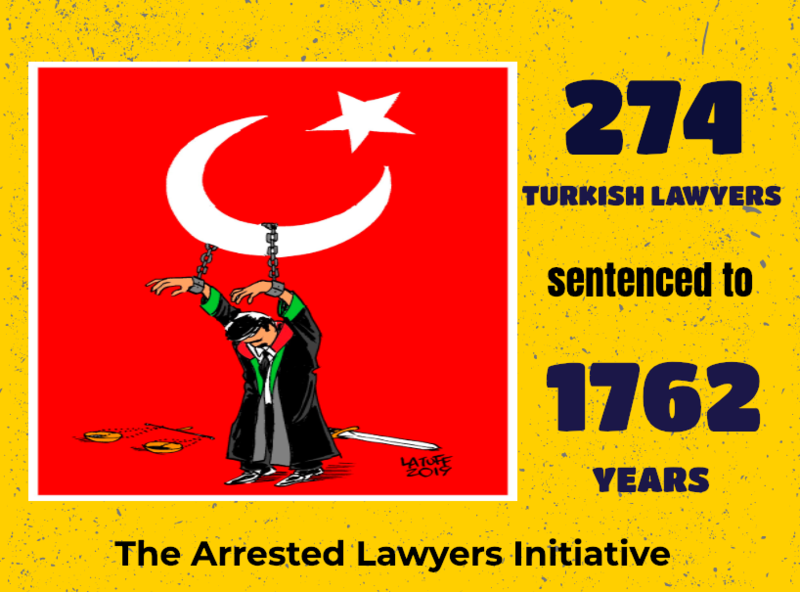 In addition to the arbitrary arrests and torture committed during detention that many witnesses attest to, and the prosecutions carried out purely on the basis of identifying lawyers with the cause of their clients, the Turkish government is also attempting to permanently undermine the profession’s independence using disturbing legislative measures. The Government adopted an executive decree on 22 November 2016 to order 370 Turkish civil society organisations to be closed, on the pretext of their presumed links to terrorist organisations. These organisations include many major lawyers’ associations, especially those working in the field of human rights. Another decree published on Saturday 29 October 2016 stipulated that conversations between a lawyer and a client accused of “terrorism” shall now be recorded, that the presence of a guardian during their meetings shall be compulsory, and that the written documents they exchange must be approved by the authorities. In addition, should the judge deem it necessary, lawyers’ visits may be suspended for six months. The OIAD emphatically denounces this large-scale repression, which not only affects lawyers by also magistrates, journalists, academics and, more broadly, Turkish public servants. With this in mind, the OIAD has urged the diplomatic authorities of its members’ home countries as well as the competent European and international authorities to act decisively against these unacceptable abuses carried out by the Turkish authorities. Governments shall ensure that lawyers (a) are able to perform all of their professional functions without intimidation, hindrance, harassment or improper interference; (b) are able to travel and to consult with their clients feely both within their own country and abroad; and c) shall not suffer, or be threatened with, prosecution or administrative, economic or other sanctions for any action taken in accordance with recognized professional duties, standards and ethics. The OIAD calls upon the international legal community to remain active and tirelessly remind the Turkish authorities of their responsibilities and their duty to preserve the rule of law and individuals’ fundamental rights, even when these individuals are accused of terrorism.